i've been uploading all the doodle-alla-day!!!! finally this sucker is working!!!! hooray! I was having a sad-ish day....I don't know why loneliness can creep up in the afternoons and makes me wish I had someone's arms to fall into and just hug me! but today was one of those days....I think loneliness attacks everyone...and the worst part is that you feel like you are the only one feeling lonely! so here's the video and all it's re-uploaded glory!!!! Cover Girl has been around forever....and it won't kill your wallet to try new colors!!! so have fun...and it always makes you feel better when you feel pretty! Love it, and totally know what you mean about the loneliness thing...how it creeps up, and a good hug would make it all so much better! Sending you big hugs through the airwaves...from Northern Cali to Southern. BTW - love the look! Don't be sad Kandee, even though we aren't with you physically we still are here for you! I'm soooo going to my local drugstore tomorrow to pick up everything you used- LOVED IT!!! AWWWWWW,,,, HERES A ((((((hug)))))) DON'T EVER FEEL LONELY, GOD IS ALWAYS WITH YOU AND YOUR FRIENDS HERE ARE ALWAYS WITH YOU TO! We all feel lonely and kinda blue sometimes Kandee, but don't worry, it will go away eventually!! Love from Argentina! Your vids are SO inspirational!! Keep at it! Kandee Girl! I think that loneliness gets everyone sometimes. Just remember how many people you make smile! Watching your videos is like the sun coming out on a rainy day! Its something I REALLY look forward to, I love getting on your site and seeing new entries and vids! To walk a day in your shoes would be a dream!!! Love the video! Kandee don't feel lonely <3 Sending you a big hug from Sydney. I've had some really sad, lonely days over the past year. It's been a hard time but I am always cheered when I come on here and take my mind of it by making myself pretty and enjoying your lovely, sparkling personality that just shines out. The fact that 99.9% of people on here are so lovely and leave such sweet comments restores my faith in the natural goodness of most people. Pin- up looks are my favorite. The 30's 40's and 50's are my favorite eras too. Hope u are doing better;)love your videos, from a cloudy Oslo. I wonder if you can to a video where you are cutting you hair, the entire hair and not just the bangs? It would have been lovely. I've realized after moving to follow my dreams, starting over with new friends, etc. can leave me lonely, but the temporary discomfort is just a way of growing. 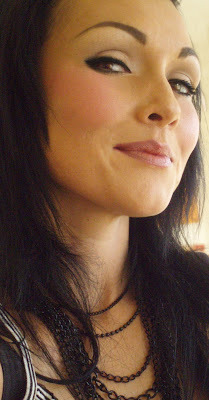 Kandee - you are so beautiful inside and out, and it is clear to see that you are very very much loved. If you ever need a friend, your web family is here and we support you 100%!!! Keep up the good work babe! HUGS! I am such a hugger so I understand. I love your videos, they get me through the day so keep 'em coming! PS. How about an Ivanka Trump video (http://cm1.theinsider.com/media/0/63/5/ivanka_trump_celebrity_apprentice_finale_1.0.0.0x0.432x651.jpeg) I am seein the person I am lonely for and this look would be perfect! Thanks. I love reading your posts! It's really refreshing to read the nice thoughts others leave. I wanted to ask if you have though more about the Glaminars on the East coast? Your videos cheer me up every time I watch one -- you are so sweet and full of joy. Not to mention, you make a lot of women look and feel more beautiful. :) I can't wait to watch this video when I get home from work. I love all the pinup looks you do and I just eat them up. I really like this one, I think you look so pretty! It's funny you say our comments make you feel less lonely because your videos do that too, for me anyway. so thanks! The incredible positive comments I'm reading from others is a testament to the person you are! When I watch your videos/read the blog, I am reminded of the Ghandi quote about being the change we wish to see in the world. And that's you! And I know it's not quite the same as a "real" hug, but look at the huge, global group hug you've got goin' on here. From Sweden to Sydney to (gasp!) Kentucky! That's me--sending you love, hugs, and lots of smiles!! Hi Kandee, Great vid!! by the way can you tell us where you get your brushes from? Hey Kandee! I recently started to watch some of your youtube videos as I have been itching to try new things with my makeup. I just wanted to say I really like this Cover Girl look as that stuff is about all a poor high school senior can afford. I have yet to try the look, but with my new eyeliner I should be able to. Every time I watch your videos I feel so impowered. You make looking like a movie star so easy. Thank you for teaching us all the tricks of the trade in an easy to understand way. Help. I don't think I get the "table" liner thing. I feel like I have liner issues. And I've watched so many videos on liner and I still feel challenged. This method looks cool. I tried it and I felt like I just wasn't sure when to start the table part and when to go back down. And it just looked weird. If you ever do it again would you consider zooming in and going slowly? THANKS!!! i love love love your videos!! i'm just starting to 'care' about makeup again, and you are such an inspiration! i have one question for you: i love the pinup look, but don't naturally have a high-arched brow. is there anyway to fake it, or exaggerate the brow without totally painting it on? thanks so much and keep up the great work! !